The future belongs to the connected. If you can’t get your organization to connect at breakneck speed, then you are falling behind. Can’t meet customer expectations? Be assured someone else will. Enterprise Integration and Information management has been the greatest unresolved problem faced by the CIO's. With rapid proliferation of applications & new technologies, enterprises are struggling to deal with the expanding landscape of software, systems and data leading to slower product or promotion rollouts, data sync issues, lack of operational visibility etc. With AURAS Gen, you can eliminate information silos and build a connected business. 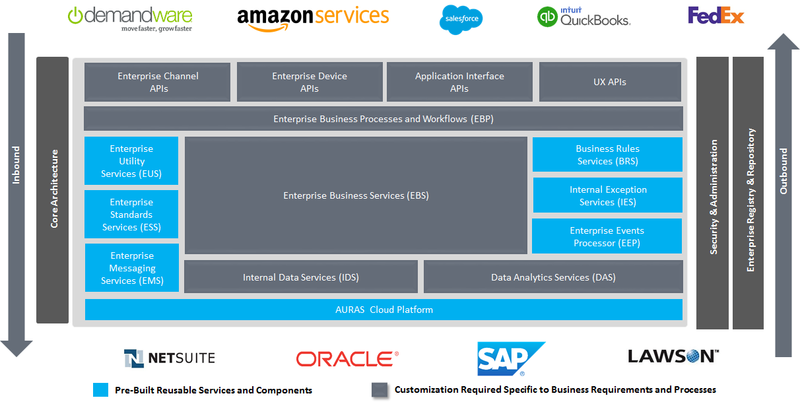 AURAS Gen is developed as a future-ready cohesive integration framework that builds the core of your digital business through accelerated speed and agility. The components serve as the foundation that can be seamlessly assembled and readily customizable based on specific business needs. Seamlessly connect your business and stay at the helm of your Digital Transformation story. Reduce your time & effort to launch new products/ services to the market. A streamlined integration ensures an improved collaboration with your partners and vendors.